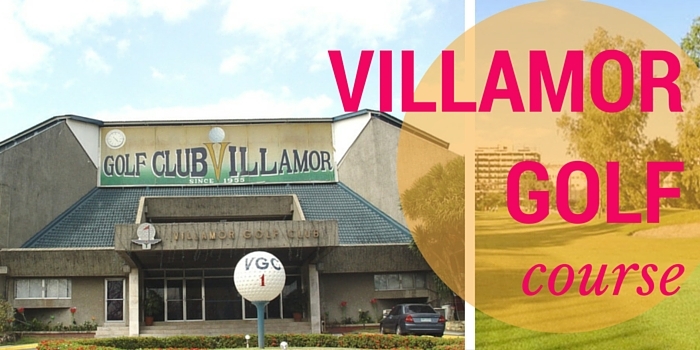 Villamor is an 18-hole par-72 championship golf course located on the corner of Lawton Avenue and South Super Highway. 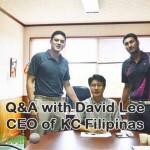 It sits just to the south of the Makati Business District, on the highway going south. The course has a total yardage of 6,681. It is fairly flat, but still challenging to golfers of all standards due to the trees and water hazards. 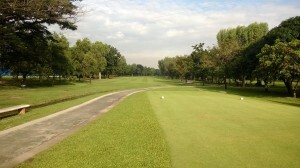 The fairways are lined with agoho, ipil-ipil, nara and mango trees. Indian tulips mark the 150-yard point on each hole. 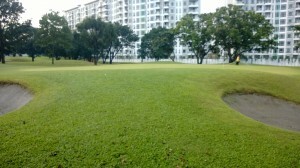 The grass on the fairways is native carabao grass, which is ideally suited to the tropical climate. Facilities include a driving range, practice putting greens, practice pitching greens, golfer’s lounge, tee house, pro shop, men’s and ladies’ changing rooms, massage facilities. I have not tried the massage facilities but the tee house and changing rooms are clean and serviceable. 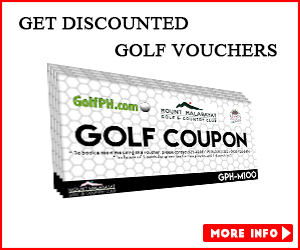 The course is typically frequented by any and all and I mean that in a good way. The sheer accessibility of this course is a big reason why the volume of people that frequent this piece of land outnumbers many a golf course inside and outside the metro. 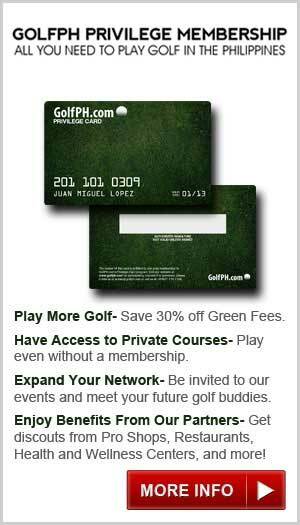 Some clubs like to be exclusive and they are welcome to be but golf as a game, is meant for everyone. 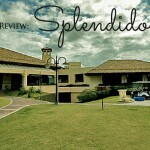 This is where Villamor Golf Club excels. It’s not a long course by any means but don’t take that to mean it’s an easy one. 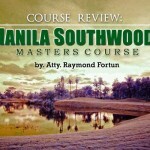 It used to play host to the now ‘invisible’ Philippines Masters. The walk starts off innocuously enough with a tight Par 4. Measuring a tad over 350 yards, it’s short enough but there is a stream crossing the fairway at 150 yards and a bunker on the right at 200 yards. I played a 4 wood and was left with an easy 9 iron into the green. The green is slightly elevated and sloped wickedly towards the back. The green was playing slow and I misjudged the speed and ended up with 3 putts for a bogey start. 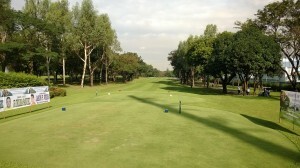 The 2nd is a Par 5 measuring 509 yards in length. It’s a dogleg-left with a pond at around 220 yards. There is another pond in the middle of the fairway and bunkers dotted all around it and the green. I played it smart and went for the green in 3. Trouble was that I had to lay-up before the second pond and found myself with a hard wedge to the green which is a two-tiered affair. I landed on the wrong tier and was faced with a tricky up and down putt for birdie which I missed. I managed to par that hole however and moved on to the 3rd which is another dogleg left. It’s only around 359 yards in length and its best to stay right. If the pin position is on the left, you will thank me for asking you to stay on the right. The left side of the fairway is full of trees and can hamper your second shot, unless you are a master of the 130 yard bump and run with a hook in your pocket!! As long as you stay out of the bunker on the right of the green, you should be alright. Now begins the tough stretch. Holes 4 and 5 are just nasty and the 6th is not far behind! 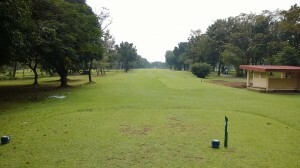 Hole 4 is an uphill par 3, around 180 yards in length. The green does not accept a well struck shot and you will find yourself in the light rough to the back. Better to be short than long. 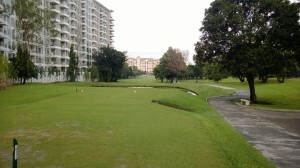 5th is the handicap 1 hole on the course and the fairway is skirted by high rise condominiums to the right and trees to the left. It then veers off to the right. Take a hybrid to the center, unless you are brave enough to go over the tree. Just don’t hook or slice your ball or you will be severely punished. There is a pond immediately where the fairway curves to the right. Only the long hitters will bring this into play. Due to the wind, I found myself hitting a 5 wood into the green (the Par 4 is only 380 yards long) and still ended up 5 yards short of the green. The 6th is a dogleg left with another pond in the middle of the fairway which really does not come into play. Play your second into an uphill green and make your way to the 7th. The par 4, 7th hole plays 424 yards and curves ever so slightly to the right. The green is narrow and with bunkers on both sides, it’s a tough ask to get par. I would actually make this the handicap 1 hole on the course but I am not the architect so I don’t get a say in this. The 8th is probably the signature hole on the course. It’s a short, 130 yards par 3 with water surrounding the green. If you blade the ball, then forget about it stopping on the green. It’s better to hit a high soft shot into the green and ensure your ball stops on the correct tier. If you do find the water, the drop area is to the left of the tee box, around 80 yards to the pin. The 9th is a routine par 5 with the water feature complicating matters a bit. If you do manage to hit your drive around 250 you will be left with a 210 yard approach to the green; definitely gettable for the reasonably long hitters. I even managed to miss a 5 foot birdie putt on what is probably one of the easier holes on the course. 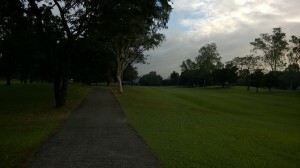 The back-nine starts from the opposite side of the parking lot and is a short walk away. By my reckoning the fun does not start till you hit the back nine. The back nine, for me, is more challenging and fun than the front nine which has a more resort-type feel to it. The 10th hole is a 400 yard par 4. There is a slight hump at around 220 yards from the tee. If you think that you will get some roll, then you are mistaken. I saw my drive clear the hump and when I got to the ball I was surprised to see that my ball had barely made it down the slope. ‘Hmm’, I thought, and looked at my caddy, who merely shook her head. Maybe she was just dismissing my chances of shooting a low round on the back-nine. Anyways, I shook off all negative thoughts and smacked my second into the green and putted in for birdie. A good enough start which was about to go south but one which I was yet unaware of. The 11th is a tight hole with a narrow fairway. To compound your bad luck, there are two bunkers squeezing the fairway on the optimal landing spot. The green is guarded by 4 bunkers of varying difficulty. I found the one to the left of the green and proceeded to splash out enough sand to cover the green twice over! The 12th is a beautiful par 3, with water to the front and right and OB on the left. In the background you can see the skyway entrance. It’s a 145 yarder and nothing more than an 8 iron is needed. The 13th is an entirely different matter though. It’s a long straight par 5 which plays uphill and downhill. Bunkers guard the fairway with OB all along the left. It’s only 457 yards in length and is definitely reachable in 2. I hit a beautiful drive which split the fairway and found myself between clubs for my second. I chose a 5 iron and hit it clean, or so I thought till I found my ball curving to the right. I had hit the rough to the right of the hole but duly pitched onto the big green with my 3rd. The green is undulating and slow. Be careful to give the ball a good whack or you may find yourself 3 putting like I did. The 14th is a 405 yard par 4 with water to the left and right. There is a small pond fronting the tee box but is there purely for cosmetic purposes and to throw you off your game. Unless you hit putter from the tee, the water really does not come in to play. The 15th is my favourite hole on the course. It’s a drivable par 4 around 265 yards in length. There is a bunker to the left of the fairway around 40 yards to the green. There is a pond to catch the slice and the green actually slopes down to this pond. The 16th is a 200 yard slightly uphill par 3. The green sits a little above the tee box and is framed by 2 bunkers on the left and right. The back of the green has 3 grassy knolls which sit slightly above the green. Be careful not to overhit your tee shot. The 17th is a 518 yard par 5 gettable in 2 and the sight of my greatest collapse. The fairway meanders gently to the right and I found my drive actually sailing towards the left of the fairway. I managed to end up in a good position to attack the pin. In trying to get to the green in 2, I actually overswung and ended up catching the ball fat and saw my ball dribble 100 yards down the fairway. Not bad, I was still on the fairway with a chance of getting on the green in regulation. I hit a routine 7 iron and missed right. 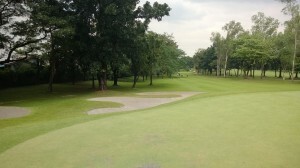 The green is guarded by 2 bunkers on the left and 1 on the right. I missed the bunker and ended up in rough. There’s rough and then there’s the rough that surrounded the green that day. It was overgrown and I huffed and puffed but was unable to blow the house down!! After 2 unsuccessful hacks at the ball, I choked down on a 3 wood and hit down on the ball to get it out. Let’s just say that if Lazarus was still alive today, we would have gladly reverted to his grave after my attempt at the 3-wood hack. 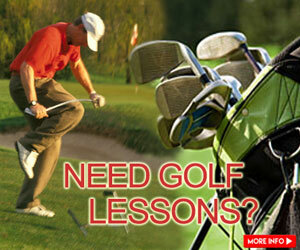 Note# If you cannot get the ball out with your wedge, don’t try the 3 wood, don’t try any wood actually. After seeing my score on that hole taking up more space on the scorecard, I moved to the 18th. The striking feature about this hole is that there are 2 bamboo trees that sit in the middle of the fairway at around 180 yards. They don’t really come into play if you can drive 220 but if your ball manages to hit those trees then it’s bye-bye ball! It’s a 377 yard Par 4 and not the most difficult closing hole. I escaped with a bogey after a customary bad second shot which overshot the green and left me scrambling. I had finished the front nine at 4 over and yet contrived to shoot 92. The back nine left me completely drained. I would happily say that this was the most Jekyll and Hyde round ever! 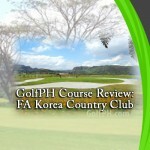 In the time I have been playing golf, I have frequented a lot of courses both in and out of the country. 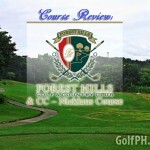 Villamor will not rank in my top 10 beautiful courses or top 10 toughest courses. Where it does rank is in my top 3 of ‘Must Play’ courses. Why, you ask? It is accessible. It is challenging. 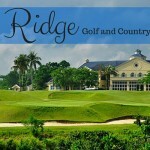 It exudes an old world charm and a sense of camaraderie where most courses fail. Not in many courses can you be sitting next to a bunch of complete strangers from really all walks of life, different social backgrounds, different age groups, all talking about how they got beat by this course. “Damn, it looks easy, but it sure is challenging” was what the 85 year old Japanese gentleman sitting next to me remarked. I agreed silently, marking down a spot in my calendar for my next outing. I have got to beat this course and get a caddy who does not smirk at my attempts to do so!